Hima Das, an athlete from Dhing of Assam’s Nagaon district, who represented India at the 21st Commonwealth Games in Goldcoast, Australia, stood sixth in the final of women’s 400 metre event on Wednesday. The daughter of a rice farmer, Hima recorded her personal best timing of 51.32 on the way to a sixth place finish. It was a brave performance by Hima considering that she was competing in her first Commonwealth Games. 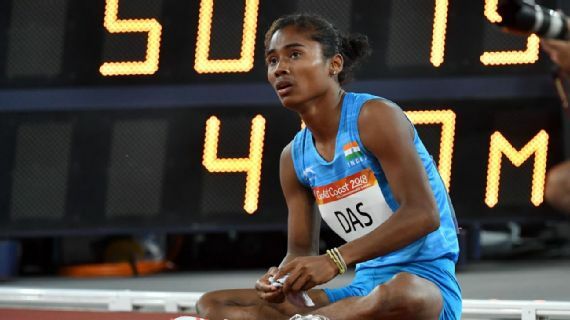 She had finished third in her 400m women’s semifinal taking off 0.44 off her previous personal best, but eventually made the cut as the seventh fastest among eight finalists. The report also stated staying eighth through the first stretch, she picked up pace nearing the final bend, going past Nigeria’s Yinka Ajayi and Australia’s Anneliese Rubie and was caught in a photo finish with Kenya’s Maximila Imali. Coach Arvind Kumar, who trained the Assam girl during the camp for the Youth World Championships, where she finished fifth, says being positioned in the inside lane worked to Hima’s disadvantage in Wednesday’s race. After Hima’s achievement in the CWG, Union Minister of State for Railways, Rajen Gohain, who is also the Nagaon MP, announced a Grade C job in the Railway department in Northeast. He also announced that the athlete from Assam will also get further facilities from the government in future.